I try not to be an emotional eater, but y’all sometimes you just need a freaking cookie! This was me last week after discovering my water heater had sprung a leak in the storage area of my basement leaving an inch of water and all our boxes in storage wet and gross. I sorted through and threw out a dumpster’s worth of ruined stuff. Days like these, it’s okay to scream things like I just need a freaking cookie…and a vacation and a maid and a big fat check to pay the plumber. Ugh. 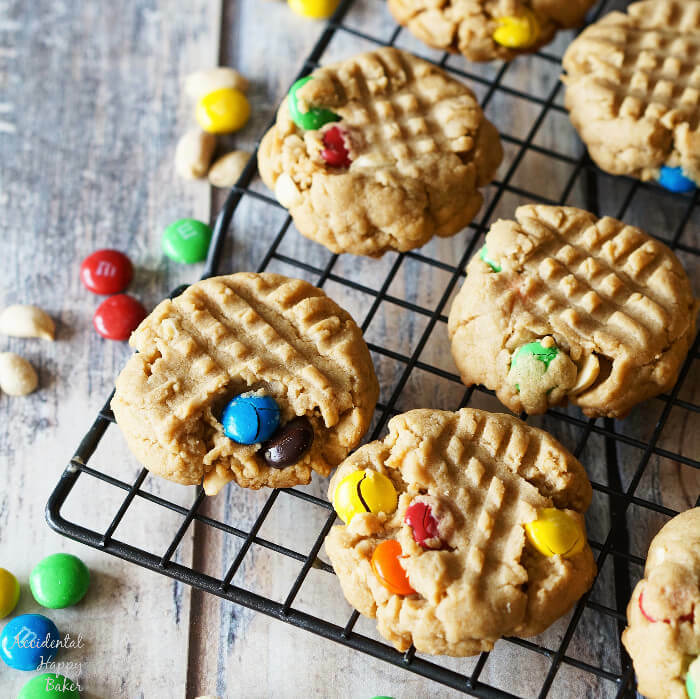 On days like that one, I turn to these chunky peanut butter cookies with m and m’s, because these cookies have it all. Soft thick peanut butter cookies studded with coarse chopped peanuts and sweet chocolatey m and m’s. They are sure to satisfy your cravings and maybe make disastrous days feel not quite so bad. This recipe for chunky peanut butter cookies is kind of a happy accident (like the rest of my life). My boys love to snack on salted peanuts, but one day I bought plain peanuts by mistake. No one would touch them. A few days later I discovered someone had found my M&M stash. They’d only left a few in the bottom of the share size bag. 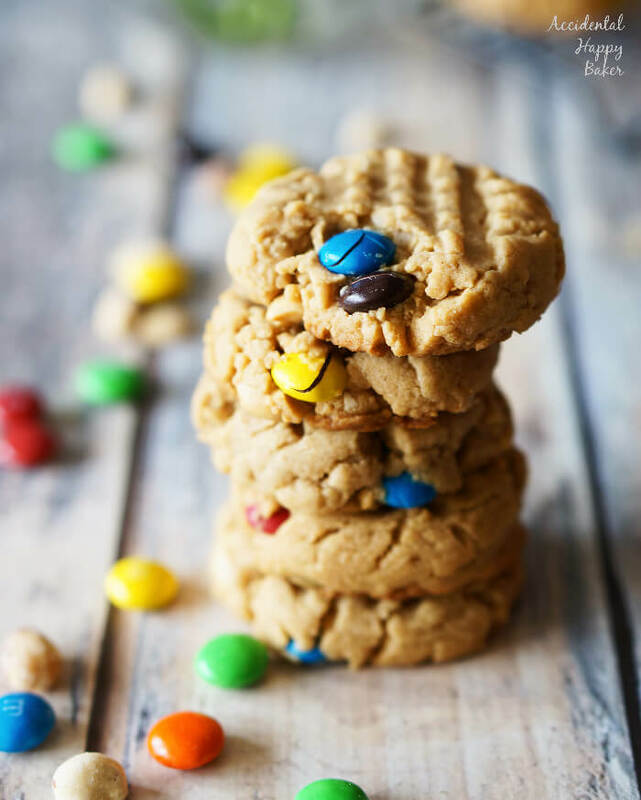 So I took the misfit peanuts and M&M’s, adding them to my favorite peanut butter cookie recipe. 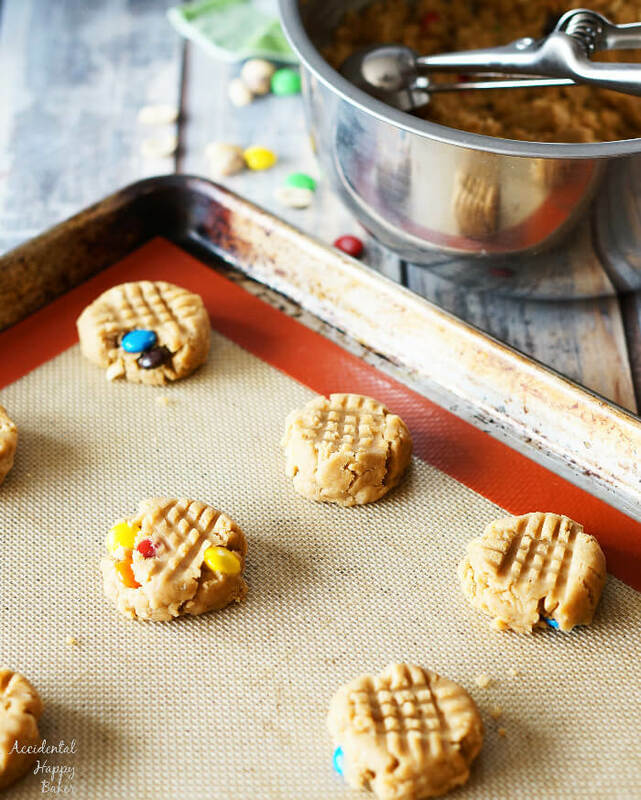 Now this is my favorite way to make peanut butter cookies! These cookies have over a cup of peanut butter and a half cup of peanuts, so you if you like my loaded peanut butter rice crispy treats, you’ll love these cookies. More peanut butter = better, right? I like putting the fork marks in the top of my cookies like traditional peanut butter cookies, but it’s totally up to you. These cookies don’t spread much at all, so if you don’t do the fork marks, you’ll want to flatten them out a bit. And lastly, these cookies do not brown much. Don’t wait until you see a nice deep golden brown on the tops or they will be over-baked, becoming dry and crumbly. 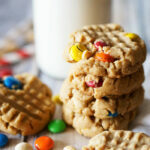 Soft thick peanut butter cookies studded with coarse chopped peanuts and sweet chocolatey m and m’s. Preheat the oven to 350 degrees and prepare two baking sheets with either parchment paper or silicone baking mats. In a medium sized mixing bowl, cream together the butter and the sugars until light and fluffy. Add the peanut butter, eggs, and vanilla, mixing well. Add the flour and baking powder mixing just until the dry ingredients are completely combined. Stir in the peanuts and M&M's by hand. Use a small cookie scoop or roll the dough into 1 1/4 inch balls. Gently press each cookie with the tines of a fork into a cross hatch design or use the bottom of a glass dipped in flour to flatten each cookie to about 1 cm tall. Bake at 350 degrees for 12- 13 minutes. After removing the pans from the oven, let the cookies rest for 3 minutes on the pan before transferring to a wire rack to cool completely. I’m new at baking so I think I did something wrong because my dough ended up being very dry and crumbly so it was nearly impossible to make balls that stuck together. Perhaps I over mixed the butter/sugar or the flour? Any suggestions? I’m not sure exactly what might have happened when you made the recipe. These are a family favorite so I’ve made them tons of times and never had that happen. Based on your description it sounds like a wet ingredient might have been accidentally skipped or something even as seemly insignificant as using different sized eggs could lower the moisture content enough to make the dough crumbly. I’m sorry that they didn’t turn out how you’d hoped. But trust me, these cookies are so worth it! Kids of all ages love these. Good heavens! I’m so glad that you noticed that and let me know Joan. What a silly mistake to have left out the main ingredient! It’s fixed now. Thank You. I plan on making this soon. You’ll have to let me know how they turn out for you Joan! Oh no! After a day like that, you deserve to eat the whole batch hun! 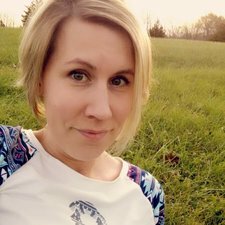 I hope things are ok now! Peanut butter cookies are my favorite. These are the perfect size. I could eat them all. These look so yumm…my kids would love them! They look simply, delicious! I know how you feel, the same thing happened to me just before Thanksgiving! Ughh! What a mess! 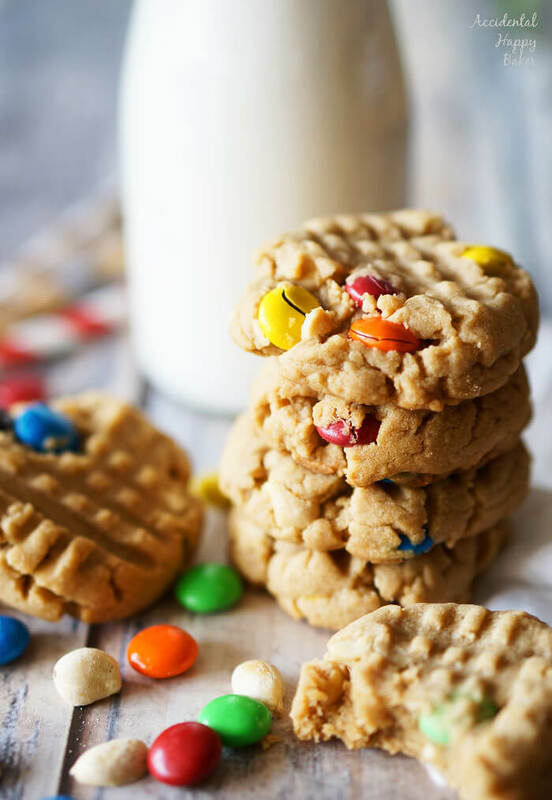 I’ve always made my peanut butter cookies just plain but love the idea of adding m&ms to the batter. Or even peanut m&ms. My kids would gobble these up in no time. Yum! Yes, these are definitely a favorite with my kids too. I think pretzel M&M’s could be an interesting addition.